Tritons’ Varsity 8 crew finished in third, while Freshman 8 crew took top honors. After a solid performance at the Stanford Invitational, the UCSD men’s crew team traveled to Sacramento, California this past Saturday for its final, regular-season races at the Western Invitational where the Tritons recorded mixed results. The Freshman 8 and Varsity 8 had the best finishes at first and third, respectively. UCSD’s Varsity 8 came in third for its first race, finishing at 6 minutes, 16.4 seconds, nine seconds behind first place Gonzaga University (6:07.2) and seven seconds behind crosstown opponent University of San Diego. Santa Clara University rounded out the race, coming in at 6:45.9 for fourth place. For the second Varsity 8 race, UCSD again finished in third at 6:23.7, seven seconds slower than its first heat. USD and Gonzaga exchanged finishes this time around, as USD took first with a time of 6:13.9, just ahead of second-place Gonzaga. The race concluded with Santa Clara coming in fourth with a time of 6:45.9. The younger Triton crew squad showed promise, as it managed to finish in first for the Freshman 8 race, running away from the competition with a time of 6:19.2. USD crossed the finish line 10 seconds after the Tritons at 6:29.6, while Gonzaga came in 18 seconds after UCSD at 6:37.9. With the regular season behind them, the Tritons now look toward the Intercollegiate Rowing Association National Championships, which will take place in Princeton, New Jersey from May 30 to June 1. 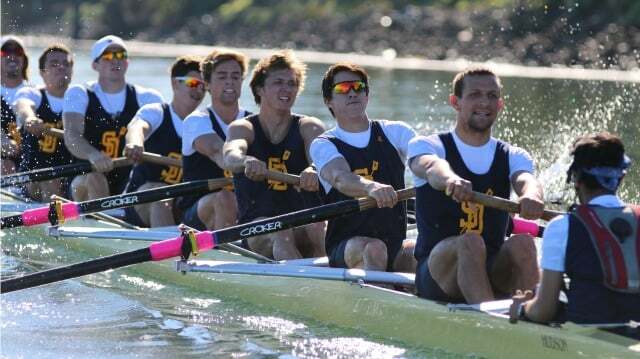 The UCSD men’s crew team is currently ranked sixth nationally in Division II. Nova Southeastern University, along with fellow California Collegiate Athletic Association conference opponent Humboldt State, are tied at second.